In order to make an organic claim or use the USDA Organic Seal, the final product must follow strict production, handling and labeling standards and go through the organic certification process. The standards address a variety of factors such as soil quality, animal raising practices, and pest and weed control. Synthetic fertilizers, sewage sludge, irradiation, and genetic engineering may not be used. Organic producers rely on natural substances and physical, mechanical, or biologically based farming methods to the fullest extent possible. Organic produce must be grown on soil that had no prohibited substances (most synthetic fertilizers and pesticides) applied for three years prior to harvest. As for organic meat, the standards require that animals are raised in living conditions accommodating their natural behaviors, fed organic feed, and not administered antibiotics or hormones. There are four distinct labeling categories for organic products – 100 percent organic, organic, “made with” organic ingredients, and specific organic ingredients. In the “100 Percent Organic” category, products must be made up of 100 percent certified organic ingredients. The label must include the name of the certifying agent and may include the USDA Organic Seal and/or the 100 percent organic claim. In the “Organic” category, the product and ingredients must be certified organic, except where specified on National List of Allowed and Prohibited Substances. Non-organic ingredients allowed per the National List may be used, but no more than five percent of the combined total ingredients may contain non-organic content. Additionally, the label must include the name of the certifying agent, and may include the USDA Organic Seal and/or the organic claim. For multi-ingredient products in the “made with” organic category, at least 70 percent of the product must be certified organic ingredients. The organic seal cannot be used on the product, and the final product cannot be represented as organic – only up to three ingredients or ingredient categories can be represented as organic. Any remaining ingredients are not required to be organically produced but must be produced without excluded methods (genetic engineering). All non-agricultural products must be allowed on the National List. For example, processed organic foods may contain some approved non-agricultural ingredients, like enzymes in yogurt, pectin in fruit jams, or baking soda in baked goods. Multi-ingredient products with less than 70 percent certified organic content would fall under the “specific organic ingredients,” and don’t need to be certified. These products cannot display the USDA Organic Seal or use the word organic on the principal display panel. They can list certified organic ingredients in the ingredient list and the percentage of organic ingredients. 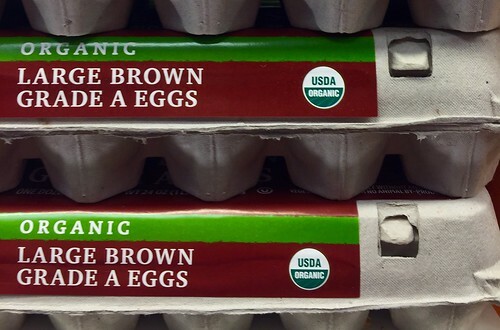 Becoming familiar with organic labeling allows consumers to make informed decisions about the products they purchase. Consumers can be assured that the integrity of USDA organic products are verified from farm to market. You can learn more about organic labeling by visiting: Labeling Organic Products.pdf. What is confusing though is that single ingredient items imported from the EU can only be labeled "organic" rather than "100% organic" because the EU does not recognize the "100%" designation. This is confusing for consumers, because they then want to know what the "other 5%" is when the single ingredient is, in fact, 100% organic. We (Del Monte Fresh Produce) currently ship certified organic product from several different Central and South American countries. Due to the limitations for corrugated packaging, we do NOT have the luxury of printing the USDA organic seal in either 4-colors or in the black (black is not a color used by Del Monte on secondary packaging). We have historically printed the label in green as has many other importers without issue. We would like to have this option reviewed by the USDA so that we do not continually run afoul of inspection agencies on the farms. Also, understand that printing a special label to go on each carton is both labor intensive and more expensive. Please what are the four specific colors and what do they mean? Do products certified as organic in Taiwan also fall under the USDA Organic Certification ? I get different answers. One source says that any products that are certified by Taiwan Ministry Of Health also fall under USDA Organic Cert Program. Another source says Certified Organic products in Taiwan are not recognised by USA nor by any countries. So if I have a product that’s certified organic in Taiwan and I’m selling in US without a USDA organic certification, is this allowed ? @Rach - Organic products imported to the U.S. from Taiwan must be certified to the U.S. Department of Agriculture (USDA) organic regulations by a USDA-accredited certifier. Products certified to the USDA standards anywhere in the world may be shipped to the U.S. and sold as organic. Products must comply with the organic regulations and should follow general U.S. trade policy. A list of USDA certified operations located in Taiwan is available in the Organic Integrity Database. The USDA organic label is losing value. Laws are becoming less demanding and changes are being made to what "organic" means. The USDA even recognizes hydroponic grown produce as organic. The organic label is about as accurate as the "all natural" label seen on highly processed foods. If it's not labeled as nongmo project, it's probably not worth getting. Until the USDA takes responsibility for maintaining the integrity of the organic label and actually caring about the well being of the country, nothing will change. I'm working on a particular project where, because of colour limitations, black ink is unavailable. We also do not have the opportunity to add add'l pantones colours. The 6 colours we're allowed are already accounted for. That means the CMYK version won't work either. Is there an option that allows for the darkest ink colour available to be used in place of black? @Ronald Beaver - thank you for your comment. The USDA National Organic Program (NOP) develops national standards for organically-produced agricultural products. The same standards apply to all USDA certified farms and businesses, including hydroponic operations. Certification of hydroponic production systems has been allowed since the National Organic Program began. @Marlee - thank you for your comment. The USDA organic seal is an official mark of the USDA Agricultural Marketing Service and its use is protected by federal law. The organic regulations currently allow two different color schemes when using the organic seal. Additional guidance on use of the USDA organic seal is available online at: www.ams.usda.gov/rules-regulations/organic/organic-seal. I would like to point out that in the CFR Title 7 Subpart D section 205.311 (a)The USDA seal described in paragraphs (b) and (c) of this section may be used only for raw or processed agricultural products described in paragraphs (a), (b), (e)(1), and (e)(2) of §205.301. Could you please tell me where is (c) of this section? I would like to know what it is so that I may make sure that I am following the CFR's correctly. When can we actually have FOOD without anything Genetically Altered, or Grown or Sprayed with any Chemical ? When I say Chemical, I mean substance of any kind listed as can do any harm in any amount no matter how minimal YOU say it is. I am pesticide TOXIC, MERCURY AND LEAD TOXIC AND HAVE BECOME SEVERELY IMMUNE COMPROMISED. I eat an all organic diet, including 100% grass fed meat now for over 13 years and still test positive for pesticide overload. I purify my water and spend a fortune seeing doctors. How much is this putting a smile on your face? I have no money to spend on life because I'm busy spending my savings on trying to stay alive from a compromised immune system. I can't eat bread, grains, legumes or even milk. Do realize how much that impairs your eating? How about you? I can't go on vacations or fun. Understand that all organic products sold in USA must be certified to the USDA NOP organic regulations. Australian certified organic is currently not recognised by USDA. Is it allowed then to sell a 'conventional' product but at the back of pack still list use of Australian certified organic ingredients? @Sophie Tan - thank you for your comment. In the U.S., if you want to sell, label or claim that a product or its ingredients are organic, your final product generally needs to be certified to the USDA organic regulations. Organic products imported to the U.S. must comply with the USDA organic regulations or be certified to an equivalent international standard, meet U.S. labeling requirements, and maintain organic integrity during the import process. If your product is not certified to one of these standards, you must not make any organic claim on the principal display panel or use the USDA organic seal anywhere on the package. On the information panel, you may identify USDA-certified ingredients and ingredients certified to an equivalent standard as organic and identify the percentage of organic ingredients included in the final product. @Danny - thank you for your comment. There is no difference between colors. Black & white—on a white or transparent background with black outer circle and black “USDA” on a white or transparent upper half of the circle with a contrasting white or transparent "organic" on the black lower half circle. Full color—on a white background with a brown outer circle and with the term, “USDA,” in green overlaying a white upper semicircle and with the term, “organic,” in white overlaying the green lower half circle. There is no other information about certification. Is it lawful to claim that the product is made with organic ingredients? My concern is prompted by my (adult) son's purchase of this product. I can email photos of the box, if you like. @Laurel Hanke - thank you for your comment. "Made with Organic" is a labeling category for products certified to the USDA organic regulations. Access the Organic Labels Explained infographic to learn more about these categories. The Organic Integrity Database is a searchable database that can be used to find information on certified organic operations and USDA-Accredited Certifying Agents. The database lists the company name for each certified operation and the products they are certified to produce or process. It is possible that a product’s brand name is different from the manufacturer’s or packer’s name. When searching the database, you may need to look for the manufacturer or packer shown on the back of the product label, rather than for the product’s brand name. A search of the database shows that Organic Certifiers, Inc. (OC) is a USDA-approved certifier.